They’re crawling their way back into Washington in an attempt to destroy America as we know it. How? The 2018 Midterm Elections. And Trump needs YOU to help stop them. 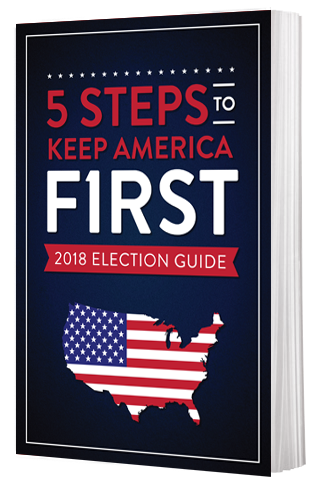 With this FREE 2018 Election Guide - you can head to the polls this November - knowing Trump would be proud of the votes you cast. And if Democrats come out on top, Trump’s America will be gone for good. Imagine your grandchildren being scolded for praying in school. Or kids growing up never knowing the National Anthem by heart. Our Founding Fathers will be rolling over in their graves as traditional values like Faith, Freedom, and Family disappear before our eyes. Today only, The Horn News is offering a FREE 2018 Election Guide. In it, you’ll find everything any true patriot needs to know to protect these values at the polls this November. For the past 3 years, The Horn News has been on the front lines of Trump’s fight to Make America Great Again. This is the latest battle in the everyday fight to deliver the God’s honest truth to the American people. The liberal media is doing everything they can to hide the importance of these elections and keep Trump supporters from flocking to the polls. But the fight is growing larger, and Trump needs your help. Democrats have already hit the ground running and Conservatives need to act fast. Former Obama donors are pouring millions of dollars into Democratic campaigns, doing everything they can to make sure Trump loses power. That’s why you need to act now. By simply reading these 36 clear and concise pages, you will be more prepared and well-informed than 99% of Americans heading to the polls on November 6th. And doing everything in your power to protect the constitution that this great nation was founded upon. Please, don’t hesitate to claim your FREE 2018 Election Guide and spread this information. It can only be offered to a select group of patriotic Americans, and today you’re one of them. If you act now, you can stop the return of Obama’s administration and drain the swamp for good.